Shiiine On Weekender returns to Butlins Minehead and is a multi-genre musical feast focusing mainly on the Halcion music of the late 80’s / early 90’s. Shiiine is much more than the music or the bands; it captures the very essence of the times. 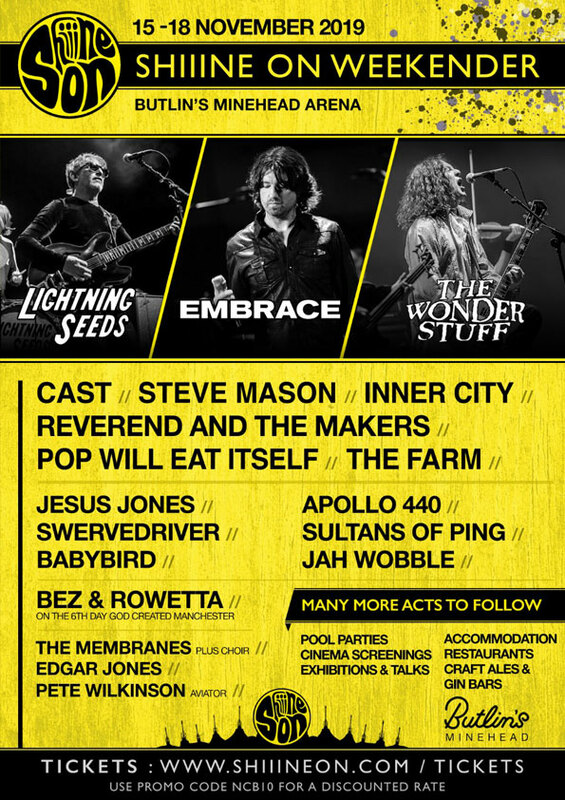 Read the Festivals For All Shiiine On Weekender 2018 Review for just a flavour of what this cracking weekend offers. Over this epic three night weekender, there will also be pool parties, film screenings, talks, amazing DJ sets and a chance to check out music that defined a whole culture and generation. Butlins Minehead - The perfect party location – non-stop music and entertainment by night plus so much to do and fantastic facilities to enjoy by day. Whether you’re after a rush of adrenalin or a simple dip in the pool, they offer a fantastic choice of action-packed pursuits and places for relaxation, and much of it’s free. Included in the music weekend: 3 nights’ accommodation / Access to all bars, facilities, and live music venues / Live performances from big name acts / Beautiful seaside location. Ticket prices (from): Priced based upon occupancy and accommodation package. See Ticket Link for details.